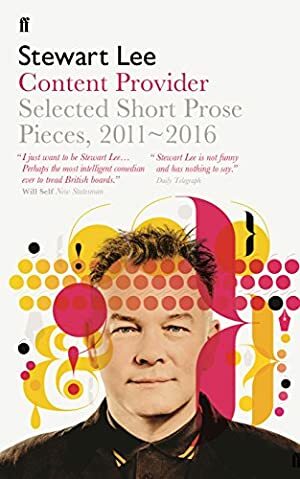 Over the last few years, often when David Mitchell has been on holiday, the comedian Stewart Lee has been attempting to understand modern Britain in a weekly newspaper column. Why are there so few right-wing stand-ups? Who was Grant Shapps? What does your Spotify playlist data say about you? Are Jeremy Corbyn and Stewart Lee really the new Christs? And so on. Introduced, annotated and, where necessary, explained by the author, Content Provider is funny, grumpy and provocative. Track It. This book has been £2.13 within the past year. Log In to track Stewart Lee on eReaderIQ. to be notified each time the price drops on any book by Stewart Lee. to stop tracking Stewart Lee. We started tracking this book on May 24, 2016. This book was £10.09 when we started tracking it. The price of this book has changed 96 times in the past 1,059 days. The current price of this book is £5.69 last checked 9 hours ago. This lowest price this book has been offered at in the past year is £2.13. The lowest price to date was £2.13 last reached on November 24, 2018. This book has been £2.13 2 times since we started tracking it. The highest price to date was £10.32 last reached on June 28, 2016. This book has been £10.32 one time since we started tracking it. We last verified the price of this book about 9 hours ago. At that time, the price was £5.69. This price is subject to change. The price displayed on the Amazon.co.uk website at the time of purchase is the price you will pay for this book. Please confirm the price before making any purchases.